Raintree Athletic Club would like to introduce the newest recipient of the RAC Fitness for Life Scholarship, Annie Carey. The Fitness for Life Scholarship enhances the recipient’s club experience, and provides guidance toward a healthier lifestyle and fitness tools to achieve success. This year’s recipient, Annie Carey, is excited to start using the full benefits of the scholarship. Looking to improve her strength, flexibility, and overall health, she has started working out with Certified Personal Trainer Tracy Ibarra, and consulting Certified Personal Trainer and Nutritionist Ashley Talebi for all her nutrition needs. These are crucial resources to aid Annie in accomplishing her goals this upcoming year. She has set a goal for herself to lose 10 pounds, but for her, it is about much more than that. 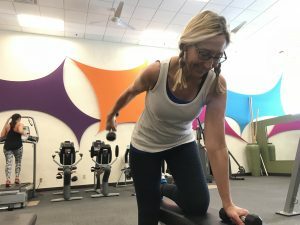 Seeing those around her suffer from illness has inspired Annie to take the initiative in her own fitness journey. With her newly acquired tools provided by the team at Raintree, she is better equipped than ever to take on that challenge. We would like to wish Annie good luck and will be checking in with her throughout the year to see her progress. Congratulations Annie!